There’s nothing quite like the feeling of relief you experience immediately after you have passed your motorcycle test – your riding career is just about to begin. You may feel like you are on top of the world, but in truth, it’s likely that you are nervous about your first independent ride. Predictably, newly qualified riders are the most vulnerable road users, and this is largely due to their inexperience on the road. The only way to increase your confidence on the roads is to regularly ride and get more and more experience. Below we have offered some pieces of advice that may be of use for your first independent rides. It’s common for newly qualified riders to quickly become overconfident on their bike and forget that a slight mistake could result in disaster. Don’t show off to your mates by riding at ridiculous speeds, and don’t feel pressured or intimidated by other road users. Maintain a speed that is within the speed limit, and at one that you feel comfortable. For safety purposes, it’s recommended that all motorcyclists wear protective attire, but new riders should especially make sure their clothing is suited to riding and offer the best level of protection. This doesn’t just mean boots, leathers and your helmet, it means making sure that all of your clothing correctly fits you. Items of clothing that are too tight or too loose, too hot, uncomfortable or inflexible can be distracting and take your focus away from the road. When you get your new outfit, it would certainly be helpful to go on a few short journeys to get used to what the clothing feels like, preparing you for when you tackle the longer rides. It’s likely that you would have been taught this during your motorcycle lessons, but it’s worth reiterating – never overtake when approaching a junction. 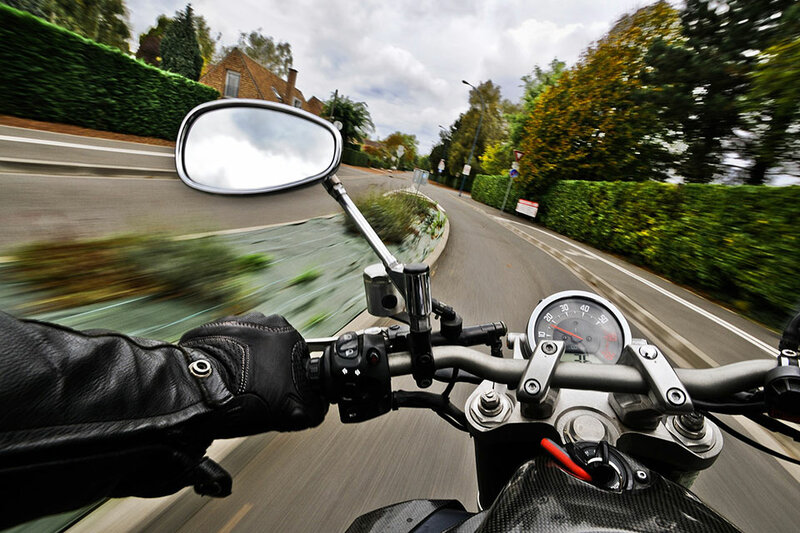 One advantage of riding a motorcycle is having the ability to overtake, but knowing when and when not to overtake is crucial. When approaching a right turn, it’s possible that the vehicle in front may turn right without indicating or giving any warning, and when approaching a left turn, it’s possible that the vehicle in front of you is slowing down to allow another vehicle out of the junction. Both of these scenarios could result in a collision and severe damage to you and your bike, if not worse. For the safety of both yourself and other road users, never predict the actions of other vehicles. Not only should you be concentrating on yourself, but you should also be aware of the movements of other road users. It’s not uncommon for vehicles to forget to indicate, particularly on the motorway, so don’t assume anything whilst riding. When riding on smaller urban roads with cars parked either side, be extra cautious of hidden driveways and children emerging onto the road from in between cars. For scenarios like this, it’s best you ride at around 10mph (but this will depend on the nature of the road). The most effective way to increase your confidence on the roads is to get out there and ride, however, you won’t be able to do this if your bike is in a poor condition. Make sure you have tyres appropriate to your bike, your riding style and the weather conditions. Expensive tyres are generally much more reliable and of a higher quality. Avoid second-hand tyres as they offer considerably less safety and are often responsible for MOT failure. Once you have suitable tyres, you should be regularly checking their pressure, depth and for any wear as these can cause the bike’s performance to suffer. It can also be beneficial to invest in some tools to be able to maintain your bike’s condition. Instruments such as a Chain Monkey and a tyre repair kit are useful to have for certain scenarios. A good idea to help you improve your skills on your bike would be to attend extra training and courses. Whether you are a newly qualified rider, or are experienced and want to freshen your riding ability, these additional courses can be extremely worthwhile and often reduce your insurance premiums. Bikes are notoriously known for being an uncomfortable ride, but there are ways to maximise your comfort. For example, make sure the brake and clutch levers are in a suitable position – having them too high can cause an awkward stretch and an unpleasant ride.